Do you need to revamp or launch your company's translation and/or localization plan? How do you know? Where do you start? If your organization has the need to translate or localize product documentation, software, corporate website, other marketing materials, or employee training materials then, chances are you've struggled through: budget overruns, escalating estimates, complicated dependency trees, project delays and unpredictable translation quality. Good news! Help is at hand. 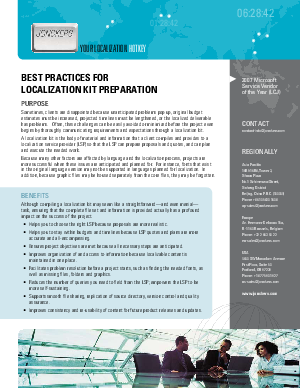 This free Best Practices Guide for Building Localization Kit from Jonckers Translation & Engineering provides handy checklists that will help you prepare for your upcoming localization projects. Download your copy of this handy guide today!